Today however, ongoing problems of poor design details and lengthy remediation of building defects are issues with which the whole industry continues to struggle. The recent Australasian Corrosion Association’s New Zealand Branch (ACANZ) seminar in Auckland addressed the durability aspects of these issues, what the background is to them, and what might be done about it. It was seen as such an important discussion that ACA’s Chief Executive Richard Reilly, Chairman Dean Wall and Project Manager Ross Boucher, attended from Australia. 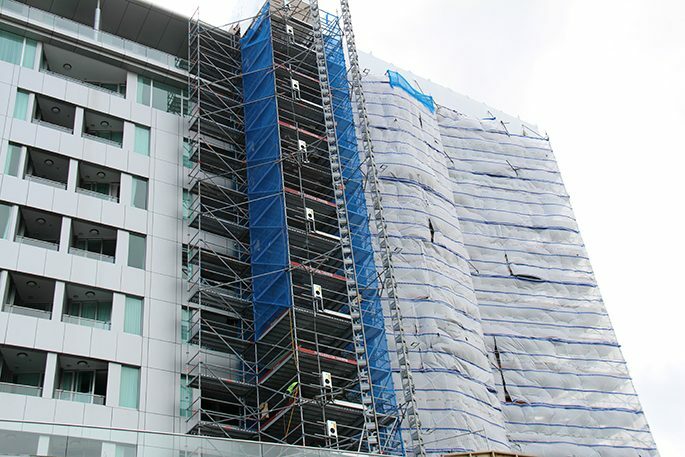 The public expects structures complying with the New Zealand Building Code (NZBC) to perform for up to 50 years depending on its purpose, and a system of Producer Statements (PS) was developed in which engineers and architects are required to sign off separate parts of a build to demonstrate compliance. This places the onus on “approved experts” to show that design and construction work complies, not the local authorities who issue building consents and Code Compliance Certificates. Currently, engineers and architects sign a series of PS forms certifying the compliance of every material in the situation presented. Clause B1 of the NZBC deals with the structural design of buildings, and in this area experts agree the system is working well. However, Clause B2 specifically deals with durability – which requires a different set of skills and training. Acceptable solutions for the five, 15 or 50-year lifespan of individual steel components is a lot more complicated to confidently sign off. Clause B2 is intended to certify that all components will last as long as they should – sometimes up to 50 years depending on how easy they are to replace and/or remediate. When all components perform as they should, the asset should confidently be expected to last at least as long as its intended design life. Achieving this presents a number of serious challenges, however. One is expecting unrelated disciplines (e.g. architects or some engineers) to understand enough about the performance of the various metals involved, or the wide range of protective coatings available, to successfully sign off a PS2 that complies with Clause B2 of the NZBC, or to peer review it. This arrangement has therefore not always worked as well as it could. Further limitations of Clause B2 include an inability to define phrases such as “acceptable standards” and other generic expressions, which need to be described more tightly for those signing off the relevant paperwork – as well as for those peer reviewing them, and for local authorities accepting them. While everyone wants to achieve a good finished build, seminar attendees agreed that all sectors need to upskill around the demands of metal durability. Every sector involved in the construction of an asset has their own experts, but in practice it’s been found that not all fabricated components leaving one area to be treated or installed in the next are always finished to an appropriate level – even assuming the following stage has workers familiar enough with the previous area to identify a potential problem. Inevitably, any faults devolve to the last person working on the element which isn’t always fair, seminar participants agreed. What should people do who are required to sign off PS2 (Durability) forms? While ensuring an asset’s durability has been a requirement in one form or another since 1994 and definitely needs revision, a multi-disciplinary approach around durability, including input from architects, materials scientists, engineers and councils, could be of real benefit, pointed out materials scientist and corrosion expert Les Boulton of Les Boulton and Associates Ltd. Such requirements demand knowledge of how metals perform structurally in many different environments, how coatings and their application characteristics can be affected, and even the impact of using the wrong fasteners within a given material or set of materials. One solution currently involves suitably qualified personnel signing off PS2’s from design guides. Approval is usually stated in a letter accompanying consent applications submitted to councils and includes a consulting engineer signing off Clause B1 and specifically excluding approval of specific issues they may have with Clause B2. “There is no guidance on how an organisation and/or practitioner can become qualified to undertake steelwork and other metals’ durability design,” notes Raed El Sarraf, Corrosion and Asset Integrity Consultant for WSP Opus. He proposed that appropriate accreditations and qualifications be developed with Engineering NZ, perhaps leading to Chartered Professional Durability Practitioner certification. It would be expected that such a qualification would require at least five years’ field experience following tertiary achievement before a participant could demonstrate competency, much like current CP Eng. requirements in other engineering fields. While its ultimate aim is to deliver a robust design guide that should make designs less susceptible to errors, the code allows Councils to set their own criteria and interpretations, and risks limiting the uptake of new technologies especially from smaller players. Durability of an asset’s various metallic components is too often overlooked or at least misunderstood, experts feel, and despite nearly 25 years of the NZBC, the complexities of Clause B2 and sign off via PS 2, durability issues seems unlikely to be resolved any time soon. The ACA is a not-for-profit, membership-based Association that aims to reduce the impact of corrosion for stakeholders. Over its more than 60-year lifetime, the ACA has continued to provide an expert knowledge base and consistently disseminates information on corrosion and its control through a range of activities across New Zealand and Australia.